Digitization and new business models have strongly changed the global trade of stock images. With over a decade of research experience, the Global Stock Image Market Research Group (GSIM) at Heidelberg University invites practitioners, researchers and industry experts to attend a half-day conference on current developments of the stock image market and future challenges for picture agencies regarding copyright, business models, and global markets. 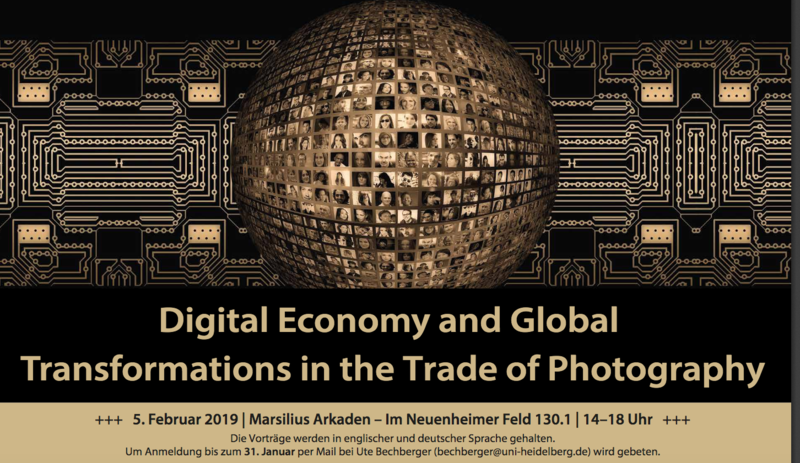 The conference takes place on 5 February 2019, 2-6 pm, at Heidelberg University in Heidelberg. Speakers include Sylvie Fodor (Executive Director of CEPIC), Lars Bauernschmitt (University of Applied Science Hannover), and Johannes Glückler & Robert Panitz (Heidelberg University). To register for the conference, please send a short note to Ute Bechberger (bechberger@uni-heidelberg.de) until 31 January 2019. We are looking forward to seeing you in Heidelberg.